Some time ago, Frederick Schilling of Dagoba suggested I add some stainless steel balls to my ice cream maker "conch" in an effort to refine the chocolate a little. Well, that did not work really great. Some, but not a lot. It did get me thinking, and looking and wondering what I was actually trying to do and why it was not working. I realized I needed to get the whole thing rotating on it's side, but to do that, the container would have to be sealed like a jar.It turns out, what I was trying to "invent" was a ball mill or jar mill. Well, there are no inexpensive ball mills out there that fit our needs, but what there is out there are rock tumblers. I pick one up, put a plastic "jar" in it (the one it comes with is NOT food grade plastic), added a handful of 1/4" SS balls and some granulated sugar and started it tumbling. A day later, I have a wonderful powdered sugar ready to add to my cocoa liqueur. A little more research into ball mills lead me to a number of pyrotechnic sites, as they grind their own chemicals. References seem to indicate ball mills can easily reduce particles to 10-20 micron, which is exactly where refined chocolate needs to be. I even found a few references that chocolate can be refined this way. Go figure. The next test will be to add the sugar to some cocoa liqueur and see how the resulting chocolate is. I will also be trying to grind the cocoa nibs directly this way (maybe no need of the Champion?) and various combinations of nibs and sugar, pre-ground and not. I will keep you all up to date with this "new" refining technique. 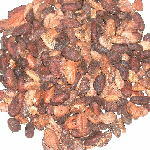 I have been wrestling with whether Chocolate Alchemy should start offering Cocoa nibs for sale. I am of two minds about it. I really want to convince you that it is not difficult to make your own chocolate, and that roasting is not that bad and come one, just jump in and do it. But on the other hand, I don't want to roast up pound after pound of beans just so you don't have to. It isn't that it is difficult and I really want you to have the control of your chocolate. But it is time consuming to set up the grill, in the pacific NW (north wet :-), and supply in a timely fashion, roasted nibs. It is just a different order of magnitude to roast enough for a batch of chocolate and roast enough to supply a business. So, I have come to a compromise. We are now going to offer unroasted cocoa nibs at no additional charge. This really goes to the heart of making chocolate at home approachable, without sacrificing service (I just could not keep up with demand), quality (fresh roasted is just so much better), and price (the cost of roasting is just not profitable, in the time sense). In addition, I think unroasted nibs may end up being a lot more easy to roast than the whole beans. I am going to start testing on this, but you should be able to roast them very effectively on top of the stove in a wok or large skillet, or with a heat gun in a bowl. Either way you should be able to see so much better how the roast is progressing and have immediate visual and aroma feedback about your roast. So, if you want fresh unroasted cocoa nibs instead of whole beans, just say so in your order. There should be almost no extra delay as cracking and winnowing with the Cocoa Mill is very easy, and that I can keep up on. What you will get approximately 20-25% less in nibs than in whole beans. You wouldn't be losing any nibs, just husk. But you wouldn't be getting an extra "nibbing" fee. So for 2 lbs of cocoa beans, you will get about 1.5 lbs of cocoa nibs, more or less. There is going to be a little husk here a there. I am not perfect and they don't have to be either. Once you have roasted, the remaining husk will be much lighter and if you just use a blow drier like I outline the in Cracking and winnowing section, that bit of husk will blow right away. The worst case scenario is that the Champion Juicer's screen will catch it just fine. Like I said, these will still need to be roasted, but I know it can be done on the stove top. I have roasted coffee that way, and this should be even easier . Sweet Maria's has a great mailing list for coffee roasting. Wok roasting and heat gun roasting are discussed there quite a bit (I am a member there) and any technique you use for roasting coffee can be applied to cocoa roasting. The temperatures are a bit lower for cocoa, but the techniques are the same. If you want to give one of these methods a try I would recommend practicing with something else first. From my own roasting experience, I would use sunflower seeds. They are about the same size as cocoa nibs and you can see very well if you are burning or scorching them. Once you can roast/toast them gently and evenly you are ready for cocoa nibs. In general, get a good heavy wok or skillet and put it on medium heat. Add your sunflower seeds (or nibs) and gently stir them. Don't rush them and get the heat too high, or you will just burn them. Adjust your heat a little up or down depending on how they are behaving. I would expect a pound to take 10-15 minutes. The seeds should end up a nice even burnished color. Cocoa nibs should be done when they have darkened a little (but not too much) and smell of baking brownies. If you ruin them, try again. Seeds are a lot cheaper than cocoa nibs. Finally, this is a lot more difficult to explain than to do. Practice with the seeds, ask me questions and finally, just give it a try. OK, that was rather quick. The Certified Organic Madagascar is gone, and that was the last of the crop. Everyone is harvesting right now, so new shipments are not in for a little while. The next we will see will be some new Ghana Forastero, and if everything goes right (I am not getting my hopes too high), four new Venezuelan Criollo regions. Samples are due in soon, and I will decide then which of those I want to carry. Maybe all, maybe none. Thank you all, and I hope you enjoy the beginning of the holiday season. As promised, the Products page is all updated. We have added a Sampler pack and the Novice kit. The Apprentice kit and Alchemist Kit will be available in about a week or so. Since the Novice and Apprentice kit both contain roasted beans, please allow a week or so processing time for getting it prepared. This is especially important if you are thinking about one of these for a holiday gift. 550 f really is to hot of an ambient temperature to roast in. Where as the beans were not burned, a burned flavor started to come through. I think the husk started to char just a little, or maybe just stuff on the grill. Keep your roasts 450 F or less. Pick a target temperature for your beans. Roast around 15-20 minutes for a test roast. If it is over roasted, either roast more beans or decrease your initial grill temperature. Once you hit a roast level you like, adjust your time to suit the flavor you want out of your beans. Overly long roast times will tend to mute flavors. Too short of a time may well be sour and/or uneven. On my grill, I can roast 3 pounds to 260 F in 20 minutes. I like this profile quite a bit, although the flavors are just starting to mute a little. I may need to pull my batch size back half a pound so that I can shorten my overall roast time a little And finally, remember, each bean will be different. I roast them all before offering them and will try to give you an idea where I like them roasted. But in the long run, it is up to you to decide what you want your chocolate to be like. My suggestions are just that; my suggestions. They are not right or wrong. You are your own Chocolate Alchemist! Just a few updates. We are getting very low on the Ghanan Forastero and the new Certified Organic Madagascar. If you want to try either, I would recommend doing it soon. I expect we will be out by the Holidays. We are now offering a Sampler pack. It will consist of one quarter pound of five different cocoa beans. This way you can try them out in a couple of recipes and decide which you like the best. The price is $20.00 plus shipping. We do not have the Products page updated yet with them or the next product(s). Kits: We have been having a lot of requests for both introduction kits and roasted cocoa nibs. Well, for the time being I am going to combine the two. The "Novice" kit will consist of 2 lbs of roasted nibs of my choice (although I will take requests, but can't guarantee I can fulfill them), 8 oz of certified organic cocoa butter (in convenient half ounces cubes), 1 oz of lecithin, and 2-3 chocolate molds (designs again left in the hands of fate), and some basic directions and recipes. If you have a Champion Juicer, this kit will set you up on the road to a few pounds of home made chocolate. The price will be about $30.00 but more on that once the new Kits page is written and finalized. Just after Thanksgiving in all likelihood. The "Apprentice Kit" will contain roasted and unroasted cocoa beans, so you can start getting a feel for roasting. It will also have cocoa butter and more chocolate molds. The "Alchemist kit" will not contain anything really special or different that you could not just purchase individually, but will have a price break when you include a Crankandstein Cocoa mill. Basically a nice kit if you just want to jump in with both feet. Let me know if you think of a variation in kits that you don't see. I am always open to suggestions. As requested by a few people, these will be available for the Holidays and should make nice gifts. 1)	Don't use powdered sugar. The cornstarch combines with trace water and with the application of heat, thickens the whole mixture too much. 2) You don't need powdered sugar. This was a major surprise. Apparently 2-3 days at 110 F with trace water around dissolves the sugar and that portion of the grit is gone. Thanks to the advice of Frederick of Dagoba, I added about 200 one quarter inch stainless steel balls to the second batch. In effect this made a ball mill. A day into the conch/refining I checked the batch and it was just starting to smooth out the extra grit. I then dropped the motor and that experiment ended, but I would call it a partial success. So give it a try. Get a $15 ice cream maker, a heating pad and some SS balls and you can give refining a try. Also, I made a neat discovery about hiding the "grit flaw". Just take your chocolate (go ahead and conch it, but don't worry about the refining portion, i.e. no balls) and add nuts, fruit or even some ground coffee to the batch. The texture of those items completely overshadows the chocolate texture flaw and no one but you, me and everyone here will know how you made such great chocolate. The second shipment of Madagascar cocoa has arrived and we are very pleased with it. All the same deep red fruit notes, same interesting red color. The Product and Review pages are all updated, and the price is a little less than originally anticipated. Please check it out. This is a very interesting and dynamic bean. On a slightly different note, a number of people have asked about Fair Trade cocoa beans. The crux of Fair trade is that the farmers are receiving a "fair" price for their cocoa beans in the expectation that it is profitable for them to produce them, and that the farmers will prosper and continue to produce beans in the future. There are also some certification processes involved and some stipulations about the beans being from a co-op, not just single farms. What I am attempting to get at here is to say, look at our prices. They are where they are not because we are making huge profits but because we are paying significantly more that the world market as they are "specialty" cocoa beans. By no means am I trying to imply that our cocoa beans are "Fair Trade" because they are not. Usually it is because the producers have not gone through the paperwork or they are from small farms (these Madagascars and the Barinas come to mind). What I am saying is that we do pay a "fair" price for these beans and that is making it to the farmers. Likewise, none of our beans (including the Ghana) were produced by any child slave labor. I know that has and does plague the chocolate industry. In addition, most certified Fair Trade cocoa that I have seen has all been general "hybrid" cocoa. What are the thoughts on this? Do you want any Fair Trade cocoa bean (that tastes good of course) or a Fair Trade Criollo or Trinitario? What it comes down to is that along with Certified Organic, Fair Trade cocoa is next on the list. I hope when the present batch of Ghana (which is very low) is replaced, that will be Fair Trade Certified. Please let me know your thoughts on this. It matters! Well, I finally finished putting a number of recipes together. I am struck by the fresh fruit aroma coming off of the roasting beans. Sort of a general deep fruit flavor instead of any one fruit. Not like the flowery Ocumare. Actually, in a way, this liqueur does remind me of a red wine. Deep fruit or slightly dried fruit flavors and aromas. Apples, currents, and of course the raspberry. It is backed up by the earthy leather flavor but is nicely balanced by just enough acidity. I have found some people both in the coffee and cocoa industry (maybe food in general) shy away from the term acidity, but without it, you can have such a boring or flat flavor profile. It is again quite different from any bean I have. I like that." I will have a more detailed review when they come in and I can verify the crop. They should be in next week and will be available then. The one pound price will be $15.75 and go down from there. Please check these out. They are like nothing available out there. And Organic to boot. I had a wonderful visit last weekend from a delightful woman named Heather (I hope it is alright to use your name Heather, no last name though) who was down in California learning to bake bread professionally. I have just verified that it is a breeze to make chocolate syrup for use in whatever you might use chocolate syrup for. Personally I am stirring a spoonful into my morning coffee for an instant REAL mocha. Just take the cocoa beans through the process of getting to cocoa liqueur (roast, crack and winnow (optional), and grind in the Champion). I pour this up into ice cube trays for convenient 1 oz portions. Bring the water and sugar to a boil to make a sugar syrup. Turn off the heat, add your cocoa liqueur (4 cubes) and let it melt. Whisk it all smooth once it is melted and refrigerate. Like many fresh products, this is not going to be just like Hershey (gods, I hope not :-). It may separate a little (a little lecithin in the cocoa may help this, more testing later) from day to day and is definitely going to taste stronger. Just give it a quick stir before using. Finally, please experiment with the proportions. One person has reported using no sugar at all for a great unsweetened chocolate milk. I think the next batch I make I will double the cocoa. I am going to keep this very short. After quite the wait, the new stock of fermented and unfermented Venezuelan Barinas Criollo cocoa beans have arrived. I will begin processing the back orders and get them out ASAP. If you have been waiting to order until they were actually in, here they are. Also, I have been experimenting with the prototype mill from CrankandStein. It works like a charm. It looks like we will be adding a large hopper due to bottlenecking. I had 3 lbs of cocoa beans cracked in a little over a minute even so. With a good strong hair drier set on cool, they winnowed out in only a couple minutes. 3 lbs of cocoa from roaster to nibs in about one half an hour. Sweet! Finally, we have begun discussing conch/refiner designs with CrankandStein. This could be it folks. The last piece in the Home Chocolatier's Alchemical Laboratory. I had the opportunity to sample an organic cacao bean the other day. It was from one of the other cocoa bean sellers on the web (no I won't name names) and I was thrilled to have the chance to evaluate someone else's stock. It was not Criollo (a hybrid from what I could tell), but it was organic. Well, that thrill ended almost as soon as I opened the sample bag. These smelled like someone had sprayed old wine in the bag. It was so sour. Talk about first impressions. Well I continued on, trying to give this bean a fair chance, especially because I had heard such good things about it. I peeled a few, noting the interesting purple interior (and oddly one light tan one) and tasted them. Ack! Again sour. On top of that they were waxy, and terribly astringent with an aftertaste that just would not go away. And other people liked these and ate them as "health snacks". Huh? To be completely fair, I went ahead and roasted them up. I nib (remember that term from a while back?) all of my samples roasted so they are on an even playing field. I popped them into my sample roaster, and turned on the heat. 100 F, 200 F, waiting for the "brownie" smell, and only getting hot sourness. 250 F, still nothing. 300 F. Sourness was going away, but no odor of chocolate at all. Finally a few beans started cracking at 325 F, a bit higher than "normal". That usually occurs at 300 to 310. I turned off the heat, let them completely cool and tried one. Most of the sourness had disappeared (thankfully) but nothing had taken its place. It was just this rather bland, cocoa-less, astringent "nut", with a "offness" that made me want to rinse my mouth out. Unfortunately, that did not help, and 10 minutes later I was still tasting it. My conclusion: Organic is not everything, nor does it guarantee anything taste wise. I will continue to carry my "transitionally organic" Barinas cocoa beans, and look for other organic and Fair Trade cocoa beans, but I won't buy them or sell them if I don't consider them good quality. You have my promise on that! After all, Chocolate Alchemy is about making something that sets your taste buds dancing and excites your senses. Alchemists of old may have been trying to make gold from lead. We are making chocolate from cocoa beans, but they knew enough not to try and make gold from manure. If in doubt about a cocoa bean's flavor (especially if no description is given), ask for a sample. I will send out samples if you are having trouble deciding between a couple of different cocoa beans. I see no reason other sellers would not do the same. New Organic Fermented and Unfermented Cocoa Beans! If you are looking for fully raw cocoa beans for their health benefits, I have what you want. I am very excited about this. First of, let me says, these cocoa beans are actually "transitionally organic". What that means is the farms do not yet have their certification, but are in year 3 of the 4 year program and are expecting certification this time next year. On that note, they are also working at having these certified Fair Trade. These particular cocoa beans are from four smaller farms in the Barinas region of Venezuela who are paid a fair trade price. Over the past few months I have received a huge number of requests for cocoa beans that people can consume raw for their health benefits. In general, I have answered that any of my beans should work for that purpose BUT I highly recommended peeling them as the fermentation process leads to "a quantifiable risk of contamination". No, I have never heard of anyone becoming sick, but I also like to pass on the information I have. On a similar note, I had many people not want the fermented cocoa beans as they were not "truly raw" as the fermentation process does heat them up and it is in theory possible that some of the nutients (flavonal) is lost. Well, I finally was able to procure some fully unfermented raw cocoa beans that I would recommend for straight, unpeeled consumption. They have a nutty, rather almond like appearance and texture, and are quite different from their fermented counterpart. As they are not fermented, the cocoa flavor is less pronounced, but it is there. What is not there is any hint of bitterness sometimes associated with raw fermented cocoa beans. I personally don't taste any unpleasant bitterness in Criollo, but some people do. This has none of that. In addition, I also have it's fermented counterpart for sale. I will do a more complete evaluation later (on the order page) but initially, this is a very well balanced, very smooth tasting cocoa bean. It is solidly in the middle road between the Ocumare's fruitiness and and Carenero's heartiness. These are the same bean, but you can see the effect of the fermentation. Venezuelan Barinas - "transitional organic"
If you have any questions, want an quote or want to place an order, just e-mail me at alchemist at pcinw dot com. If you are looking for a quote or order, tell me which and please include your mailing address and I will get the information back to you including S/H. Finally, just because I don't have photos of all of my stocks of beans, here are the rest of them for comparison sake.